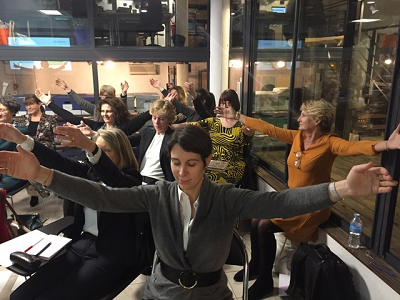 For those who missed this great moment here are the highlights of the workshop“Exploring our Vulnerability !”, brought to us by Nathalie Colin and Marylyne Declercq on January 15th 2019 at the INC .
People usually see vulnerability as a weakness or being exposed to a threat, to the possibility of being harmed either emotionally or physically. Very often, they want to stay in control to avoid being harmed by the situation they are experiencing. Experience your vulnerability and your body will send you signals of discomfort, stress and lack of security: your plexus is contracted, your stomach heavy, you can even feel some shivers. And it’s normal because life has conditioned you to see vulnerability as an “enemy”. But have you ever considered the treasure hidden in vulnerability ? Probably not. 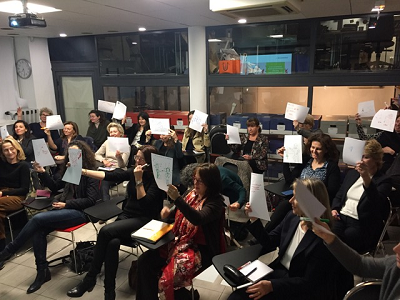 In this workshop we experimented a stepwise process to shift the perception of vulnerability, moving from a deep grounded sense of insecurity to a strong feeling of connection and authenticity. We started by inviting participants to live out the “dark” side of vulnerability, inviting them to say out loud that they are vulnerable and to draw on a piece of paper what vulnerability means to them. This exercise revealed how much it is considered a weakness in life in general, and even so at work. It helped participants to become aware of the negative emotions that emerge when we feel vulnerable (from being confused, sad, wanting to hide their emotions to actually feeling angry). It also enabled participants to describe the context when vulnerability becomes a threat: when it shows up and we don’t have all the answers or can’t control the situation. We are then very often frightened of being disconnected from our values, judged and rejected. Nathalie and Marylyne then shared some personal testimonials about the benefits of daring to embrace one’s vulnerability. They proposed a new definition of vulnerability, based on their experience as coaches and on Brené Brown’s R&D on the topic. Vulnerability is not about being harmed, vulnerability is all about allowing it to show up in situations when we feel we don’t have all the keys to hand and we decide to dare to share the discomfort we experience in the moment. After a short meditation with the objective of welcoming vulnerability as an ally, the participants worked in pairs and remembered a moment when they felt vulnerable. Each of them had to experience the moment again, yet this time daring to share their discomfort. Through this session, they were able to experiment the benefits of vulnerability. It created a deep sense of solidarity (“I feel moved by your story, I want to help you”), connection (“I feel honoured you trust me enough to share your discomfort and I now know I can trust you and share my own vulnerability”) and relief (“I live with integrity, I am loyal to my values”). As an anchor, we ended the session having all women go back to the drawing which represented their vulnerability and took the time to reassess it with their fresh and positive perspective. Nathalie Colin, Marylyne Declercq founders of “Shak’2” personal development programs. Thank you to the INC for hosting our Professional Development workshops this year and thanks to the INC team for making it happen.